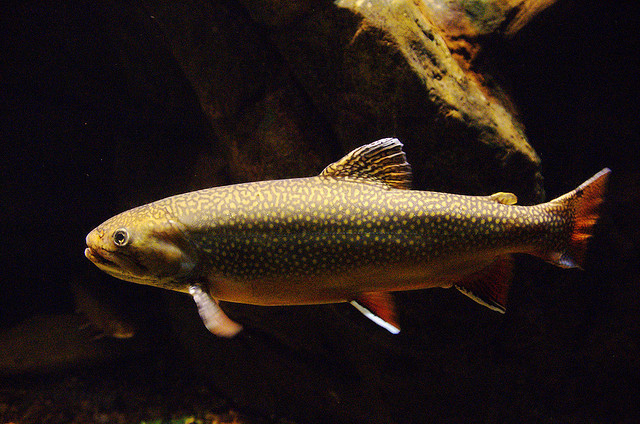 Brook trout; photo by Patrick Talbert on Flickr (noncommercial use permitted with attribution / share alike). 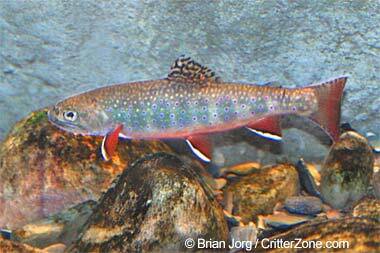 Also called speckled trout, brookies, or speckles, brook trout (Salvelinus fontinalis) live under water conditions that are cool, clean and pure (they cannot survive in polluted water). Brook trout prefer aquatic insects (nymphs) that live under the rocks and on the stream bottom, but will eat whatever they can find including land insects that fall into the water, small crayfish, and other small fish and minnows when they are easy to catch.